Flavorful Excursions: Cheesecake Factory Has a Great Menu - and Cheesecake! Cheesecake Factory Has a Great Menu - and Cheesecake! Obviously, everyone knows about The Cheesecake Factory's delicious array of 30 different cheesecakes, or whatever the number is. One of my favorites is Adam's Peanut Butter Fudge Ripple - it has everything I want in one dessert: cheesecake, chocolate, peanut butter and caramel. Still, I was reminded while dining there recently why I go there. I love the salads, apps, entrees, AND desserts. There is such a broad variety of dishes to order there, so it is hard to make up one's mind However, you cannot go wrong with any of the pastas especially the Farfalle with Chicken and Roasted Garlic, and my friends really like the restaurant's chicken dishes. Some of the entrees are pricey, so I tend to combine a couple different apps to make a great meal. My favorite app, hands down, is the Avocado Eggrolls. This seems like such a simple dish, but it is done perfectly. A great mixture of warm avocado and tomatoes rests on the inside of a crispy eggroll with a delicious cilantro dipping sauce. I get this every time I go. I also love the appetizer portion of the Belgian Endive and Arugula Salad with candied pecans. This is a simple dish, but is done well. 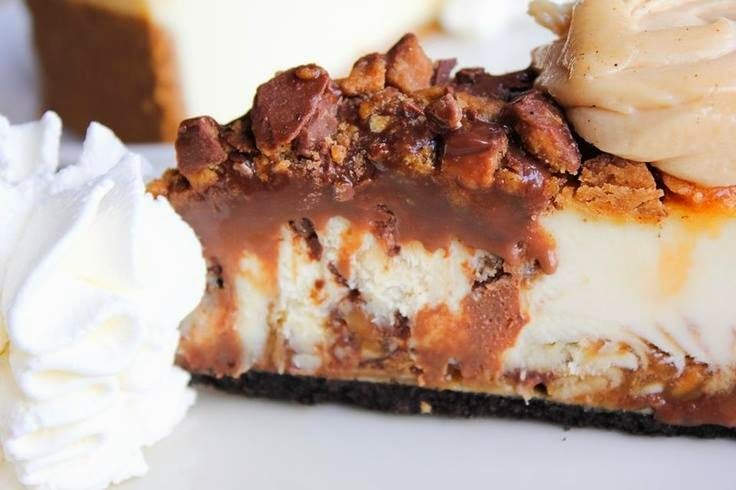 What is your favorite meal and dessert at The Cheesecake Factory?